HOW DOES YOUR ORAL HEALTH CHANGE WHEN YOU'RE PREGNANT? Congratulations! There's so much to think about and do to help your baby develop during your pregnancy. One important thing you can do to help yourself and your baby is to make sure your teeth and gums are healthy during your pregnancy. You're at higher risk for developing gingivitis (the first stage of gum disease) during pregnancy and gum disease is linked to premature birth and low birth weight. However, there is a lot you can do to keep your mouth healthy, like visiting your dentist in High Point, NC for an exam and cleaning. At DentalWorks - High Point, our experienced team helps women improve their oral health and deal with common dental concerns during pregnancy. 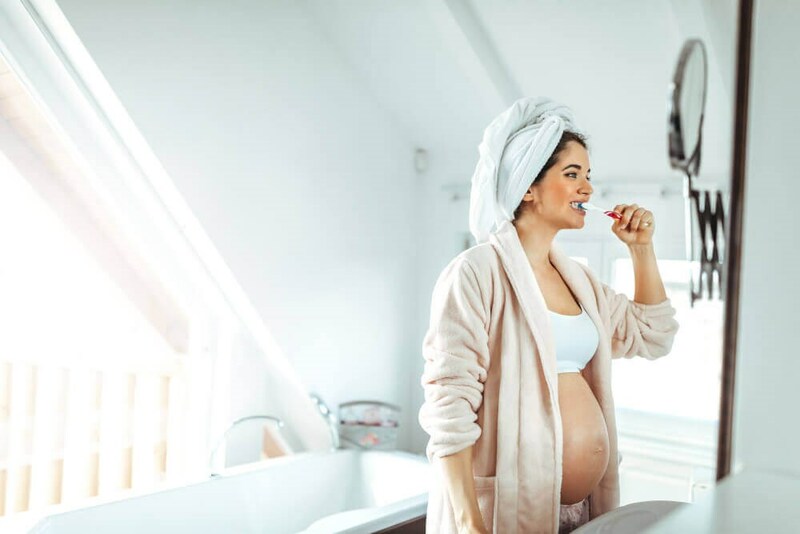 Read on to learn about how pregnancy may affect your oral health and what you can do to keep yourself and your baby healthy during this time. The chance of developing gum disease increases when you become pregnant. Your gums may be redder, more sensitive, inflamed, and bleed easier when you brush and floss. The increased hormone levels in your body make it easier for the bacteria that causes gingivitis to thrive in your mouth. Thanks to hormones and an increase in your blood flow during pregnancy, your teeth may feel a little sensitive. You may notice a sharp pain when you enjoy foods that are especially hot or cold. A common complaint among pregnant women is dry mouth. This can make it easier for cavities to form since you have less saliva to rinse away bacteria. Alternately, some women find that they have excess saliva production during their pregnancy. In addition to being an unpleasant symptom of early pregnancy, morning sickness can be a problem for your teeth. The acid from your stomach can damage your enamel. After a wave of nausea, make sure to rinse with a fluoride mouthwash or brush your teeth. Even though you should have been flossing before you got pregnant, it is especially important to do it now. Flossing at least once a day removes debris and bacteria that can get trapped between your teeth. This helps you avoid cavities and keeps your gums healthy. Fight dry mouth and rinse bacteria from your mouth by drinking water throughout the day. If your tap water is fluoridated (check with your city how much fluoride is added to your water supply) this can help improve your oral health. Keep visiting your board-certified dentist in High Point, NC for oral exams and cleanings. Be sure to tell your dental team that you are pregnant, or after your baby is born, if you are breastfeeding. They will take extra precautions with digital x-rays and other treatments to make sure they are safe for you and your baby. Your dentist may also recommend products, like toothpaste and mouthwash, that can help improve your oral health during your pregnancy and relive problems, like dry mouth and inflamed gums. Although it can be hard to avoid pregnancy cravings, do your best to follow a healthy, balanced diet. Your baby's teeth will begin to develop during the second trimester, so this is a good time to increase your intake of protein and calcium as well as vitamins A, C, and D. If you do enjoy a sugary treat (sometimes the baby makes you do it! ), clean your teeth by brushing or using mouthwash. Keep your teeth healthy between professional cleanings by brushing your teeth at least twice a day for two minutes with a toothpaste that contains fluoride. Most dentists recommend a soft-bristled brush during pregnancy so you can gently clean your teeth and massage your gums. Ask your dentist or hygienist to demonstrate the proper brushing technique during your visits to make sure you are not brushing too hard. If you need a dental procedure during your pregnancy, like a tooth-colored filling for a cavity or a treatment for gum disease, your dentist will help you decide if this can be safely performed. In general, dental treatments with local anesthesia are best performed during the second trimester (between weeks 13 and 21). Any procedures that require sedation (nitrous oxide gas or oral-conscious medication) should be avoided. Avoiding the need for dental procedures is one important reason to take good care of your oral health at home. Once your baby is born, make sure you keep taking care of your oral health by brushing and flossing every day. During your next visit to your dentist, ask about scheduling your baby's first appointment. Children should visit the dentist before their first birthday. This helps your dentist monitor your child's oral health and the development of their teeth. Your dentist can also answer your questions about how thumb-sucking impacts your child's mouth, bottle rot, and other common concerns. At DentalWorks - High Point, our compassionate team will work hard to make sure your child has a positive first experience at the dentist to help set them up for a lifetime of great oral health. Taking care of your oral health during pregnancy will reduce your discomfort during this often uncomfortable period and help your baby grow strong and healthy. If you're pregnant or thinking about becoming pregnant, schedule an oral health exam with your board-certified dentist in High Point, NC to discover how you can improve or maintain the health of your teeth and gums during pregnancy. DentalWorks - High Point offers compassionate care throughout your pregnancy and a positive experience for your whole family after your baby is born.